I had an issue with my IE 8, it kept crashing by just clicking on it to launch it, till the point I had to use Task Manager to kill the process. Then you need to reboot your system. 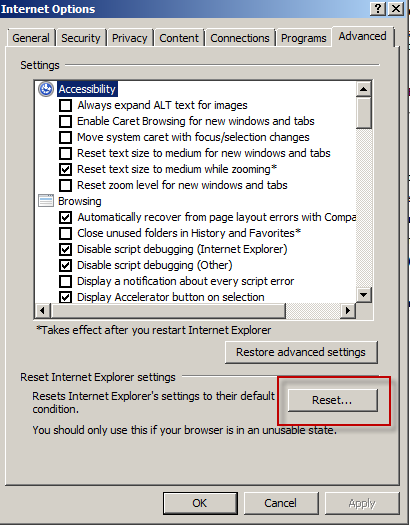 The previous KB only guide you on how to remove IE 8 and doesn't tell you how to re-install it. Looking back at the previus command, I was intrigued by dism command and after searching the web I found an MSDN article that describes this tool. Then rebooted the machine and got IE 8 installed again on the machine. 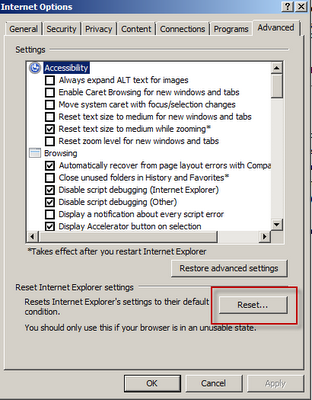 Tools > Internet Options: click on Advances tab and click on Reset button. For a good article/blog on how to troubleshoot IE issue, please refer to this Vincenzo Di Russo's Blog. Note: The previous steps also applies to windows 7. Hi, I have a problem it says 'dism' its not recognized as an internal or external command, is there another command for Server 2008 R2? ?